Boy, do I kick myself for not seeing this one coming: homemade toaster pastries. They are popping up now in DC diners — one more kitschy food to tempt Baby Boomers nostalgic for childhood and the hipsters who never left it. I doubt they will displace the ubiquitous (and largely mediocre) cupcakes that are spreading through town like swine flu in a crowded train. Still, they speak to me. Certain that I could do them better at home, with control over ingredients, I pondered the pastry and looked to my baking books for inspiration. Leave it to the King Arthur Flour Baker’s Companion to have an actual toaster pastry recipe. Too simple, right? Right. The pastry, essentially a buttery shortbread, called for overnight chilling. But even that was not enough to keep it from melting when I tried to roll it out in my overwarm kitchen. As an added complication: A lot of precision is required when cutting rectangles and matching tops from finicky dough. 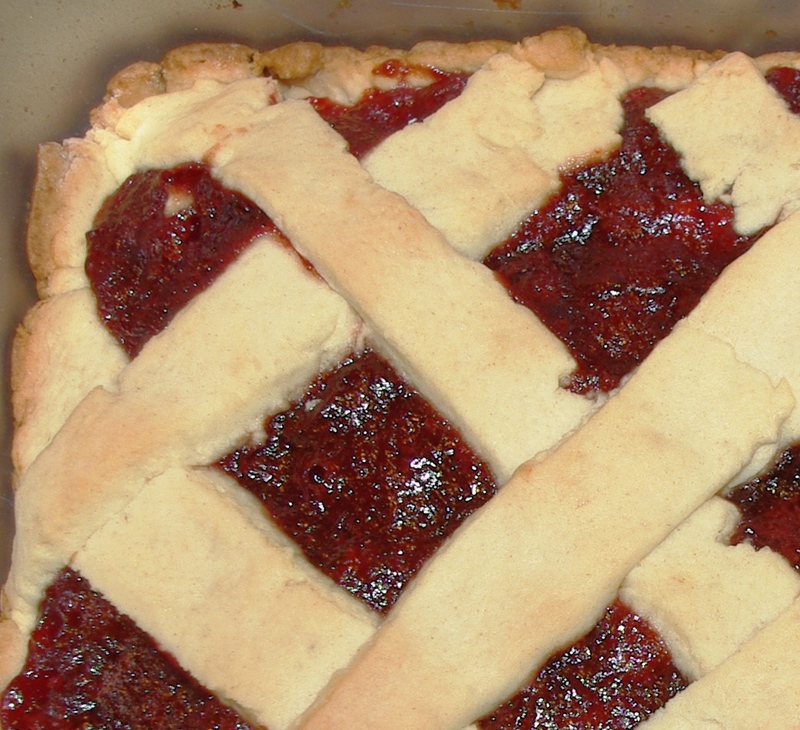 I managed one — filled it with an amazing rhubarb and red raspberry jam — and baked it to perfection. But life is way too short to spend the evening coaxing pastry off my granite countertop. So I pressed most of the dough in a baking pan, covered it with jam (mixed with a little flour), faked a woven top crust and baked it for about 25 minutes. My co-workers pronounced it — all crispy, sugary crust and tangy filling — better than Pop Tarts. I have not given up on the idea and will definitely try again — in the winter, when my kitchen is cold. In the meantime, I think I’ve stumbled on a delicious shortcut. Do you think it would have worked better with more of a basic pie crust? Definitely worth trying again, with the guava paste filling. But the real question: Would this have been acceptable to the No Pie Guy? And here’s Smitten Kitchen’s take on trying the same recipe, and also encountering difficulties with a too-warm kitchen.